"In almost every case he will be disappointed. In the opening lecture, within the first few pages of his book, within a sentence or two of his authors’ symposium, he will be told rather shortly that genius cannot be taught; and there goes his hope glimmering." "Your unconscious self (which is your wishful part) will not care whether the words you use are written down or talked to the world at large... Afterward you will find yourself disinclined to go with the laborious process of writing that story at full length; unconsciously you will consider it as already done, a twice-told tale." "Send your practical self out into the world to receive suggestions, criticisms or rejections; by all means see to it that it is your prosaic self which reads rejection slips! Criticism and rejection are not personal insults, but your artistic component will not know that. It will quiver and wince and run to cover, and you will have trouble in luring it out again to observe and weave tales and find words for all the thousand shades of feeling which go to make up a story." I first read this book about a year and a half ago when I began my MFA journey at Wilkes University. It was required reading for the fiction foundations course. I thought, at the time, "Really? A book written in the 30's about being a writer? What can this teach me?" The answer is: More than I was ready to handle. Rereading it now after having written 2 drafts of my first novel and beginning the task of a third major revision, I am blown away about how much of the book I subconsciously took to heart. I journal everyday--have since I was accepted in the Wilkes program and what it has done for is allowed me to be ready to write whenever and wherever I might have time and space to do so. Brande's assertions that writing was no longer for true craftsmen in the 30's because just about anybody "can afford a portable typewriter" had me cracking up because she would probably have an aneurism if she saw how just about anyone today could sit down and type up a few words via text or Ipad and call themselves a poet/writer. Very inspirational, I have always dabbled in writing but after finishing this book it made me want to sit down and take it a little more serious. Many different methods on bringing out that writer "magic" are discussed in very easy to do exercises. Definitely a must read for anyone thinking of becoming a writer. If you think all books about writing are the same, you need to read this book. But she also focuses on ways to release your subconscious mind, because, she says, that's where your genius is. She also addresses the discouragement that many writers face, and gives helpful advice to overcome it. A must read for would-be writers. I didn't agree with EVERYTHING she said, but most of it is quite true. This is the book that got me writing again. 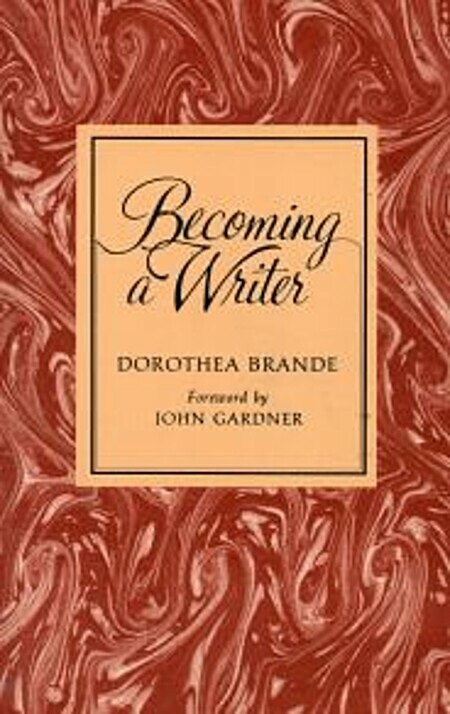 Brande stresses the play of the unconscious in writing -- but without coming across as faux-psychologist. Brande makes you work, gets you writing, and that is exactly what I needed to get doing: I was doing far too much reading about writing. I'm not sure how original any of her theories might be -- although, remember, Brande was writing in 1934 -- and some of what she's writing about has become common fodder for writing books, but the presentation and coherency of Brande's approach kept my interest piqued. The pace of the book grabs you and pulls you into it. She stresses the need to keep moving, to push forward and let the unconscious do its work. At times, I felt like I was sprinting through the book, trying to keep up with her enthusiasm. The best way to do this is to rise half an hour, or a full hour, earlier than you customarily rise. Just as soon as you can -— and without talking, without reading the morning’s paper, without picking up the book you laid aside the night before -— begin to write. Write anything that comes into your head: last night’s dream, if you are able to remember it; the activities of the day before, a conversation, real or imaginary; an examination of conscience. Write any sort of early morning reverie, rapidly and uncritically. The excellence or ultimate worth of what you write is of no importance yet. As a matter of fact, you will find more value in this material than you expect, but your primary purpose now is not to bring forth deathless words, but to write any words at all which are not pure nonsense. This exercise/technique not only brought back to me an enthusiasm for writing but also introduced an exploratory component to my writing -- just what was going to come out of the recesses of my mind? I can't over-stress the satisfaction of crawling out of bed, staggering to the computer, then -- half asleep, mind you -- pounding out 30 minutes of writing. It just flowed. The trick was to keep the censoring mind at bay and to see what my mind wanted to talk about. More than once, I found myself half-asleep at the keyboard, my mind making those crazy jumps that you often find in those after-the-alarm-rings half-dreams. The resulting story-scraps almost seemed as though written by another hand. This is a book about finding ways to write that bypass the brain’s natural procrastinating tendencies. It's not about writing techniques, styles or genres. Dorothea Brande launches straight into her programme. She starts by telling her readers to spend time each morning hand-writing. She puts no time limit or minimum amount on this, and acknowledges that it will probably be repetitive and muddled. The next exercise is to set a specific time each day for writing, planned in advance. One therefore starts to look forward to that time, to treat it as a vitally important appointment. Indeed, the main point of the book is that we need to harness the will to write, to be disciplined in our use of time. I’ve read other books that make similar suggestions, but never in such a straightforward way. Admittedly the text is long-winded in places, and the references to a typewriter are reminders that this is a very old book - first published over 80 years ago! But human nature doesn’t change; what the author describes as the anxieties of a writer are current today, and probably always will be. Excellent book for beginner writers to jumpstart their writing.